The traditional definition of “economy” according to the Oxford Dictionary is “the state of a country or region in terms of the production and consumption of goods and services and the supply of money”. According to Wikipedia, the term “Digital Economy” refers to “an economy that is based on digital technologies. The digital economy is also sometimes called the Internet Economy, the New Economy, or Web Economy. Increasingly, the digital economy is intertwined with the traditional economy making a clear delineation harder”. One way to segment the traditional economy is through classification of economic activity. 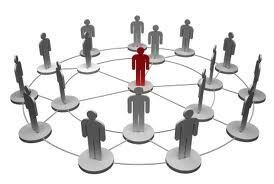 A popular industry segmentation is the NACE code. A more simplified activity segmentation is primary (extract raw materials), secondary (produce finished goods), tertiary (supply services) and quaternary (perform intellectual activities). See figure below. The ongoing transformation from a traditional economy to an economy that is based on digital technologies can be extremely disruptive. Popular examples of disruptive digital companies include airbnb in hospitality, Spotify in music, Dropbox in digital storage, Netflix in video on demand and Uber in the taxi industry. The same transformation also increasingly intertwines the traditional economy with the digital economy. We classify the interim stage between traditional and digital as “connected economy”. See figure below. For example, the online purchase of a tablet computer would involve both digital (eCommerce) and traditional (physical delivery) activities. The online purchase of a soundtrack would involve only digital activities (both purchasing and delivery). Also as a result of this transformation, traditional economic activity classification no longer captures new digital economic activities. For example, the Dutch Hosting Provider Association (DHPA) recently performed a study into the size and importance of Digital Infrastructure in The Netherlands, concluding that the Dutch Digital Infrastructure sector (e.g. hosting, data centres, carriers and cloud) is invisible in the Dutch economic statistics due to SBI codes that do not match the products and services in this new sector. 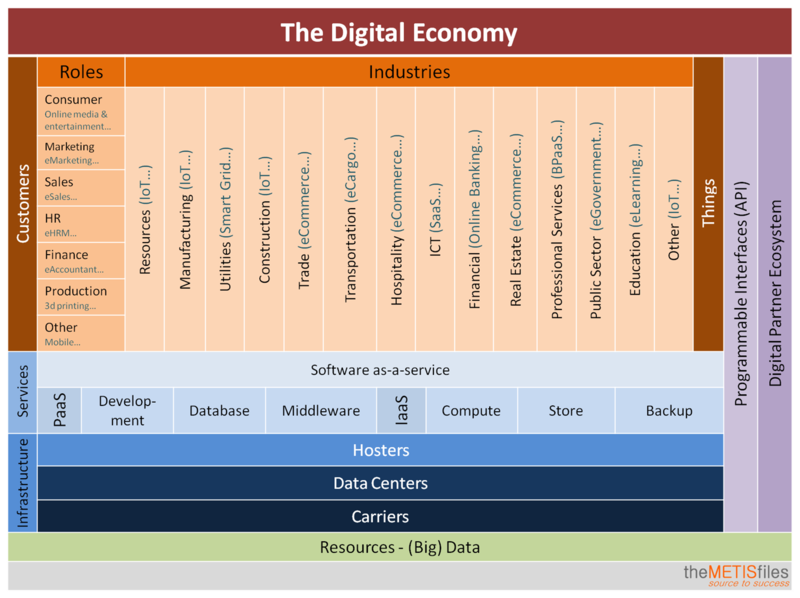 To provide a more holistic view of the traditional, connected and digital economy, the METISfiles have created a taxonomy labelled “The Digital Economy”. 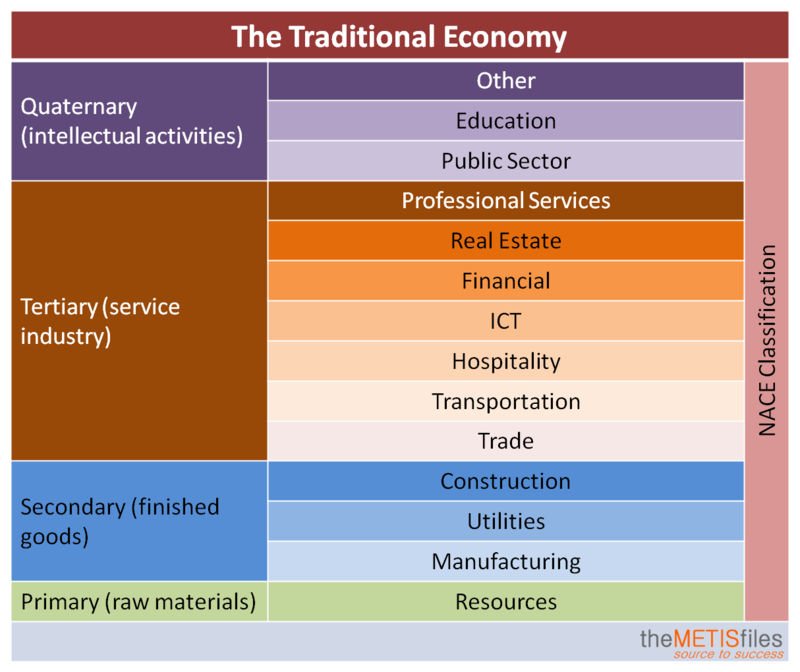 This taxonomy is presented as a wrap around the traditional economy industry classification in the figure below. Similar to the traditional classification into primary, secondary, tertiary and quaternary activities, the digital economy is classified into resources (data), infrastructure (carriers, data centres and hosters), services (IaaS, PaaS, and SaaS), and customers (roles, industries and things). For a more detailed view of the services layer, check out our Public Cloudscape. 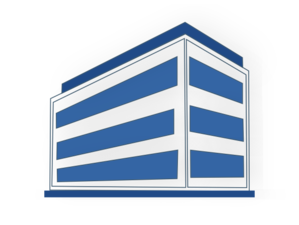 The industry classification is based on the NACE codes. In blue, an example of a connected or digital industry activity is given. For instance, eLearning as a digital activity in the Education sector and eCommerce as a connected activity within Trade. Similarly, online media and entertainment is a digital activity within consumer and 3d printing within production. Similarly, the Internet of Things (IoT) connects devices, cars, smart meters and other things within industries. Programmable interfaces (API) connect resources, infrastructure, services and customers. Digital partner ecosystems offer new routes to market. An example of a Dutch company that is disrupting the traditional accountancy (and other) automation business is Exact. Exact online is cloud based software-as-a-service. A (big) data resource for Exact is for instance the total addressable market of more than 2 million financial company administrations in the Netherlands. Exact hosts its compute and software capacity with Rackspace. Rackspace owns carrier neutral data centres. Through APIs, Exact online connects for instance to webshops for ecommerce and banks for online banking. 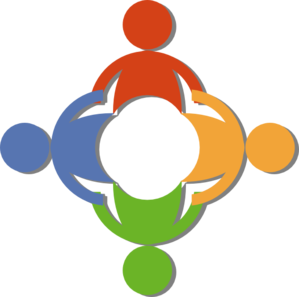 Digital accountant firms are part of the new digital ecosystem for Exact and connect with finance employees (eAccountants) and business administration within industries. With online subscription revenues up 43% in Q3 2013 compared to the same period last year and annualized recurring revenues of €21.5 million their digital strategy is successful. Is your industry transforming? Is your company part of a digital ecosystem? What is your role in the digital economy? Let us know!